A service-oriented architecture is combination of services having different platforms for implementation. These services are combined, used by, and communicate with each other. The communication is done by massage or data passing. Communication is done by interacting with each other based on different platforms. 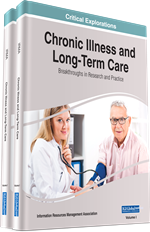 Chronic diseases are long-term illness that require observation with heavy treatments by the doctors and special attention by family members. Chronic diseases are Alzheimer's disease, Addiction, Autoimmune diseases, Blindness, Rheumatoid arthritis, Chronic renal failure, Chronic Kidney Disease, Deafness and hearing impairment, Hypertension, Mental illness, Thyroid disease, Blood Pressure abnormalities. A service-oriented architecture explain by Krafzig et al. (2005) is a service oriented application of the integration of multiple platforms. It is the newly introduced term for cross-application integration. This architecture promises to solve the big business services using its integration method of multiple platform designed in similar set of standards. This becomes possible through the inter communications between the different platforms without any intervention of humans. These can communicate by massage or data passing. Any application which is able to communicate with the other applications can be a part of this architecture. SOA is collection of independent type of services which is work perfectly when they all are combine systematically and used for different applications like business processes etc. Knorr and Rist. (2005) showed in their previous work that SOA is the combination of different services at different- different platform provide convenience to the users. The granularity and types of services. How the services communicate with each other at different level. How the services are work together (i.e. orchestrated). How services contribute to IT and Business Strategy. It is based on the idea that it makes critical processes much simpler and easy to use within a single interface. In this research service oriented architecture is used to identify level (stage) of chronic disease by using 3D medical images. In this type of diseases long treatment is required having database either in hospital or collected by family members which are based on different type of medical reports. The work of Coffey et al. (2010) by using this database and using SOA we can easily diagnose disease and going for best treatment. For example, you visit on a webpage of a bank which is the homepage. Now you want to access your account by logging in using your username and password. Knorr and Rist. (2005) showed in their previous work that an architectural based on services and technology based on integrating existing applications, these integration of services uses new Web services based on service platforms to a bus, not point-to-point.